Abstract. Studies analyzing the outcome of integrative care of end-stage renal disease (ESRD) patients, whereby patients are transferred from one renal replacement modality to another according to individual needs, are scant. In this study, we analyzed 417 files of 223 hemodialysis (HD) and 194 peritoneal dialysis (PD) patients starting renal replacement therapy between 1979 and 1996, to evaluate the effect of such an approach. Analysis was done for survival of patients on their first modality, for intention-to-treat survival (counting total time on renal replacement therapy, but with exclusion of time on transplantation), and for total survival. Log rank analysis was used and correction for risk factors was performed by Cox proportional hazards regression. Intention-to-treat survival and total survival were not different between PD and HD patients (log rank, P > 0.05). Technique success was higher in HD patients compared to PD patients (log rank, P = 0.01), with a success rate after 3 yr of 61 and 48%, respectively. Thirty-five patients were transferred from HD to PD and 32 from PD to HD. Transfer of PD patients to HD was accompanied by an increase in survival compared to those remaining on PD (log rank, P = 0.001), whereas, in contrast, transfer of patients from HD to PD was not (log rank, P = 0.17). Survival of patients remaining more than 48 mo on their initial modality was lower for PD patients (log rank, P < 0.01). A matched-pair analysis between patients who started on PD and who were transferred to HD later (by definition called integrative care patients), and patients who started and remained on HD, showed a survival advantage for the integrative care patients. These results indicate that patient outcome is not jeopardized by starting patients on PD, at least if patients are transferred in a timely manner to HD when PD-related problems arise. Many nephrology units offer both hemodialysis (HD) and peritoneal dialysis (PD) as treatment modalities for patients with end-stage renal disease (ESRD). In those centers, the choice between both dialysis modalities is influenced by a number of medical and nonmedical factors (1). The expected patient survival is one of the major medical factors. Many studies have compared patient outcome on HD versus PD for different subgroups of patients (2,3,4,5,6,7,8,9,10,11,12,13,14,15,16,17,18,19,20,21,22,23,24,25,26,27,28,29,30,31,32). The results of these studies are conflicting due to differences in case-mix, single versus multicenter design, the variable experience with PD of the participating centers, and the number of patients included. At present, the question of whether survival on PD and HD is comparable remains a matter of debate. For patients as well as for treating physicians, total survival rather than survival on one single modality is of importance. What ESRD patients want to know is which sequence of renal replacement modalities will increase their total survival as long as possible, and this with the best quality of life. Recent studies have partially accounted for this by analyzing intention-to-treat survival (21,31,32). However, these articles evaluate PD and HD more as equivalent rather complementary modalities, and no analysis is made of the outcome after transfer from one modality to the other. There are several reasons to consider PD and HD as complementary. It is well accepted that adequate dialysis is difficult to achieve in PD patients without residual renal function (RRF) (33). On the other hand, PD tends to maintain RRF longer than HD (33,34). Starting patients on PD when they still have RRF, and transferring them to HD when necessary seems thus not illogical in the concept of early start of renal replacement therapy (RRT). Studies that analyze the outcomes of patients treated with different successive treatment modalities whereby HD and PD are seen as complementary rather than as competitive dialysis modalities are, to our knowledge, not yet available. Therefore, this study retrospectively evaluates the outcome of those patients who started on PD and who later were transferred to HD, a group we call “integrative care patients.” This group was compared with a group of patients that started and remained on HD, a group that started and remained on PD, and a third group that started on HD and was transferred to PD. All patients who started RRT in the Renal Division of the University Hospital in Gent between 1979 and 1996 and who survived for more than 3 mo on their initial modality were eligible for this study. To avoid unnecessary complex statistics, patients who transferred twice or more between dialysis modalities were not included (nine patients). The files of the patients were searched for length of time on HD and PD, history of transplantation, and for comorbid conditions at the moment of start of RRT. The comorbid conditions were defined as follows: cardiovascular disease: presence of cardiomyopathy, ischemic heart disease, or peripheral vascular disease; diabetes mellitus: the need for blood glucose-controlling drugs for more than 1 yr, or the presence of diabetic retinopathy; hypertension: systolic BP >160 mmHg, a diastolic BP >95 mmHg, or the need for antihypertensive medication; chronic obstructive pulmonary disease: a resistance in the airways calculated as driving pressure divided by flow >2.5 cm H2O/L per s or a Tiffeneau index below 70% on pulmonary function test or the need for bronchodilatory medication; hypercholesterolemia: a serum cholesterol of >250 mg/dl or the need for cholesterol-lowering medication; chronic urinary tract infection: patients with repetitive positive urinary cultures; chronic liver disease: signs of cirrhosis on imaging, or chronic elevation of serum levels of transminases more than three-fold the reference value; autoimmune disorders: typical lesions on biopsy or positive serology; period of starting RRT: patients started with RRT between 1979 and 1986 (first period) versus patients started between 1987 and 1996 (second period); age: expressed as the difference between the age at start of RRT and the mean age of the total patient population. For all analyses, patients were labeled according to their initial modality, regardless of their last modality. Transfer to another modality was defined as a permanent (>12 wk) switch from one given dialysis modality to another (for example, a PD patient receiving three or four HD sessions because of catheter-related problems was not considered a transferred patient). In the first modality survival analysis, survival time is considered as the time on the initial RRT. The observation is ended at 10 yr of follow-up. Only death is considered as a final event, and patients are censored by transfer to another dialysis modality, at transplantation, loss of follow-up, or at the end of observation. In the intention-to-treat survival analysis, survival time is considered as the sum of the time on HD and the time on PD. The observation is ended after 10 yr. Death is considered as a final event, and patients are censored at the moment of transplantation, at loss of follow-up, or at the end of the observation, but not when they are transferred from PD to HD or vice versa. Both the first modality and the intention-to-treat survival only consider the time on renal replacement, and exclude the time after transplantation. These analyses are thus applicable for all patients, regardless of whether they are on the waiting list for transplantation. For patients not on the waiting list, the intention-to-treat analysis gives their life expectancy. For patients on the waiting list, it shows their probability to survive until a renal graft becomes available. In the total survival analysis, survival time is considered as the total time on PD, on HD, and after transplantation. Death is considered as final event and patients are only censored at the end of observation. Technique success is defined as the probability of having a patient alive on his initial modality. Death and change of modality are considered as final events, and patients are censored at the moment of transplantation or at the end of follow-up (12,32). Survival analysis was done with life-table analysis, Kaplan—Meyer analysis (unadjusted), and Cox proportional hazards regression analysis to correct for the presence of comorbid conditions (adjusted). In the adjusted to zero curves, all comorbidity factors were adjusted to zero (no comorbidity), and age was taken at the mean age. Comparison of survival between groups was analyzed with the log-rank test. Demographic data were analyzed by t test and prevalence of comorbidity factors with χ2 or Fisher exact test. Patients who were transferred from one dialysis modality to another and survived for at least 3 mo after transfer were analyzed separately. To exclude potential survival bias from the fact that integrative care patients had to survive at least until the time of transfer in order to be able to be transferred, two different analytical approaches were used. First, survival time was modeled as a function of the dialysis modality for patients starting on PD and transferred afterward to HD. Probability of survival was calculated per 6-mo interval, and this separately for each time period before and after transfer to the other dialysis modality, according to the method used by Aitkin et al. (33). A transfer rate of 10%/6 mo was used. Overall survival was then calculated by a macro function in an Excel (MS-Office®) spreadsheet using the results of the life-table analysis (uncorrected data). In this way, the results were corrected for dropout of patients before they were transferred to HD. Hazard rates were also modeled using linear, log-linear, and Weibull distributions, but finally, only life-table data were reported. Second, a matched-pair analysis was performed. In this analysis, for every PD patient who was transferred (group A), two HD patients (group B) were selected who had been treated on HD for at least the same length of time as the PD patient on PD. The patients were matched for age, presence of diabetes mellitus, hypertension, and cardiovascular disease. A separate log-rank analysis for survival was then performed between group A and group B, whereby survival for group A was defined as the survival after transfer, and for group B as survival on HD minus the time the matched PD patient was on PD. In this way, the survival bias in favor of the transferred patients (who have to survive a certain time in order to be able to be transferred) was avoided since they were matched with patients surviving at least as long on HD. A total of 417 patients was included in this study, of whom 223 started on HD and 194 on PD. Table 1 lists the distribution of the comorbid conditions and the demographic characteristics in the total group and in the subgroups of patients starting on either HD or PD. There were more patients with diabetes mellitus (P = 0.02) and with hypercholesterolemia (P = 0.001) who started on PD, while more chronic obstructive pulmonary disease patients started on HD (P = 0.05). Nearly half of the patients in both the HD and the PD group were started in the period 1987-1996. The mean age was 56 ± 15 yr in the total group, 56 ± 15 yr in the HD group, and 55 ± 15 yr in the PD group (P = 0.41). Patients who started in the second period were older compared to patients who started in the first period (58 ± 16 versus 54 ± 14 yr, P = 0.02). There was a higher number of comorbid factors in the diabetic patients (2.5 ± 1.2 versus 2.2 ± 1.2, P < 0.001) and in patients who started in the second period (3.3 ± 0.9 versus 2.1 ± 1.1, P < 0.001). Of the patients who initially started on HD, 35 were transferred to PD, while in the group who started on PD, 32 patients were transferred to HD. Table 2 shows the distribution of comorbid conditions in the patients who were transferred compared to those who remained on their initial modality. There was a higher prevalence of cardiovascular disease (P = 0.01), hypercholesterolemia (P = 0.01), and liver disease (P = 0.002) in the transferred patients. However, with the exception of hypercholesterolemia (higher in the PD patients, P = 0.05), there was no statistically significant difference in comorbidity at the start of the initial RRT between patients transferred from PD and the patients transferred from HD. Table 3 summarizes the reasons for transferring these patients. The main reasons for transfer from PD to HD were PD-related complications, whereas in the patients transferred from HD to PD, cardiovascular problems were the main cause of transfer. Kidney transplantation was performed in 44 HD and 53 PD patients, respectively. Nontransplanted patients were older (60.3 ± 12.4 versus 40.9 ± 13.5 yr, P < 0.001) and had a higher frequency of cardiovascular disease (P < 0.0001) and hypercholesterolemia (P = 0.03) compared to the transplanted patients. Intention-to-Treat Survival Analysis. When intention-to-treat survival was analyzed, comparable survival curves were obtained in patients who started on HD or PD (log rank: T = -1.68, P > 0.05). Median expected survival times were 47.2 mo overall, 42.3 mo in the PD group, and 51.5 mo in the HD group. When adjusted for comorbidity, the survival curves remained not significantly different from each other (Figure 1). The relative risk for mortality when starting on PD was 1.13 in the total group (T = 0.86, P > 0.05) and 1.17 in the diabetic patient group (T = 0.48, P > 0.05). Age was an important risk factor (RR = 1.04, T = 6.23, P < 0.001), as is illustrated in Table 4. In the total group, the presence of diabetes mellitus increased the relative risk with a factor 2.09 (T = 4.11, P < 0.001). Starting RRT before or after 1987 made no statistically significant difference (RR = 0.80, T = -1.36, P > 0.05). In the subgroup analysis of diabetic patients versus nondiabetic patients and of patients older or younger than 65 yr, no statistically significant difference in relative risk for starting either with PD or HD was found (RR = 1.30 versus RR = 1.27 and RR = 1.56 versus RR = 1.25, respectively). Cox-regression analysis for intention-to-treat survival. Solid line, patients started on hemodialysis (HD); dotted line, patients started on peritoneal dialysis (PD). N = event numbers. Patient Total Survival Analysis. Patient total survival was not statistically different in the two modalities (log rank: T = -0.2, P > 0.05). When comorbid conditions were taken into account, the relative risk of starting PD was 0.98 (T = -0.10, P > 0.05), as illustrated in Table 4. Every year above the mean age of 55 yr added an extra mortality risk of 5% (T = 8.49, P < 0.001). Diabetic patients had a higher mortality risk (RR = 1.78, T = 3.33, P < 0.001). Patients who started after 1987 had a lower mortality risk than those who started before 1987 (RR = 0.68, T = -2.6, P < 0.01). First Modality Survival. Unadjusted first modality survival was better in the HD group compared with the PD group (log rank: T = -2.73, P = 0.01). The median expected survival times were 48.2 mo in the total group, 55.9 mo in the HD group, and 42.7 mo in the PD group, respectively. When survival was adjusted for comorbidity (assuming no risk factors were present), the difference in survival between both dialysis modalities became smaller, but did not disappear. The relative mortality risk for patients starting PD was 1.45 (P = 0.05). The relative risk for age was 1.05 per year older than the mean age (P < 0.001). The relative risk to die for a diabetic patient was twice that of a nondiabetic patient (relative risk of 2.13, P < 0.001). However, there was no statistically significant difference in survival between the two treatment modalities in diabetic patients (RR for PD = 1.10, T = 0.43, P > 0.05). The survival for patients surviving for more than 48 mo on their initial modality, and who were maintained on that modality, was lower for PD patients, as shown in Figure 2 (log rank, P = 0.04). Log-rank analysis of initial modality survival in patients surviving more than 48 mo on their initial modality (with exclusion of transferred patients). Patient number at 48 mo is taken at 100%. Solid line, patients started on HD; dotted line, patients started on PD. P = 0.04. N = event numbers. Technique Failure. Technique failure was lower in the HD group than in the PD group (log rank: T = 2.78, P = 0.01). Technique success after 3 yr was 61 and 48% in the HD and PD patients, respectively. The relative risk for technique failure when starting on PD was 1.39 (T = 2.30, P < 0.01), as shown in Table 5. Analysis of Transferred Patients. 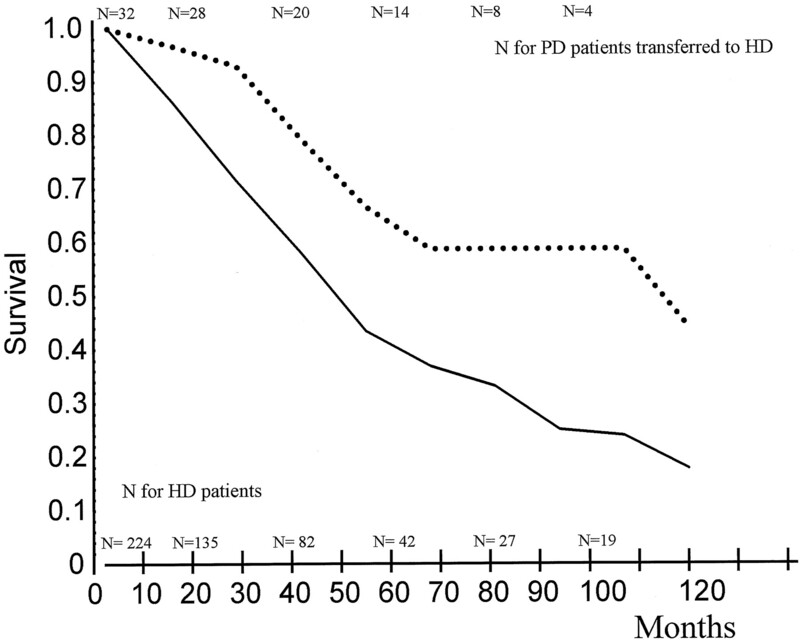 Figure 3 illustrates that patients who were transferred from PD to HD had a better survival than patients who started and remained on HD (log rank, P < 0.01). As demonstrated in Figure 4, transferring PD patients with PD-related problems to HD was associated with a prolonged survival, whereas transferring HD patients with problems to PD was not (log rank, P < 0.01). The median expected survival was 95.7 mo in the patients who were transferred to HD and only 38.4 mo in the patients remaining on PD (unadjusted, life-table analysis). There was no statistically significant difference in survival between patients who initially started on HD and were transferred to PD and those who remained on HD (log rank, P = 0.17). The median expected survival was 56.4 ± 6.6 and 49.9 ± 8.6 mo in the HD patients transferred to PD and patients remaining on HD, respectively. Log-rank analysis of patient intention-to-treat survival. Solid line, patients started on HD (without transfer); dotted line, patients started on PD and transferred afterward to HD. P = 0.01. N = event numbers. Log-rank analysis of patient intention-to-treat survival. Solid line, patients started on HD and transferred to PD; dotted line, patients started on PD and transferred to HD. P < 0.01. N = event numbers. Figure 5 shows the survival curve constructed with the separate hazard functions, according to Aitkin et al. (33) as described in Materials and Methods, for patients starting on HD and for patients starting on PD and transferred afterward to HD. Using this approach, no difference was observed in the survival curves. 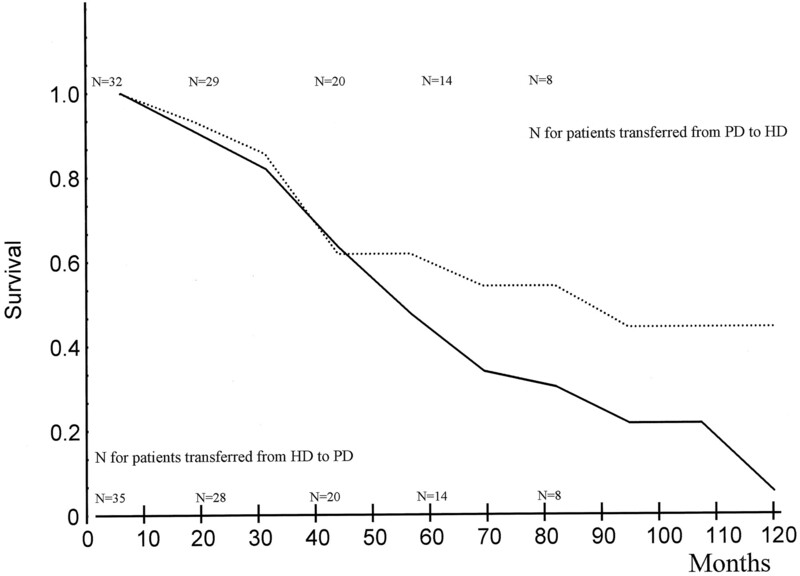 Figure 6 shows the matched-pair survival after transfer for the patients transferred from PD to HD, compared to the survival of HD patients maintained on HD over at least the same length of time as the PD patient was on PD before the transfer to HD. There appears to be a survival advantage for the patients transferred from PD to HD, which disappears 5 yr after the transfer. Survival curves as constructed using separated hazards functions for PD patients before and after transfer and for HD patients. Solid line, HD patients; dotted line, patients started on PD and transferred afterward to HD. N = event numbers. Log-rank survival analysis of matched pairs of integrative care patients and HD patients. Every integrative care patient was matched with two HD patients surviving at least as long on HD as the integrative care patient on PD. Survival is calculated from the moment of transfer of the integrative care patient from PD to HD. Dotted line, patients started on PD and transferred to HD; solid line, patients started and maintained on HD; N = event numbers. In the present study, a retrospective analysis was performed of the survival data of all new patients who were admitted between 1979 and 1996 to the RRT program of the Renal Division of the University Hospital in Gent. The data show that life expectancy for patients who started RRT with PD or with HD is not different. Further analysis shows that survival with an integrative care approach, as defined above, is at least as good as a direct start from HD (Figures 5 and 6), at least if transfer is done at an appropriate time (Figure 2). Our data indicate that both HD and PD can be considered as valuable RRT modalities. Both modalities should be seen as complementary rather than as competitive because of their specific properties. An integrative care approach whereby patients are started on PD and transferred timely to HD when PD-related problems arise makes use of the whole RRT arsenal. The observation that starting patients on PD does not jeopardize their future outcome after transfer to HD is of importance, since starting ESRD patients on PD can decrease the financial and logistic burden related to the still increasing ESRD population. In this way, probably more patients will get access to an RRT program. This may become even more important when the early start concept, as recommended by the Dialysis Outcomes Quality Initiative guidelines, will be practiced in the future. Validation of this integrative care concept is therefore warranted. In the present study, intention-to-treat survival in PD and HD patients was comparable, with a 50% survival of ± 72 mo (Figure 1). Maiorca et al. 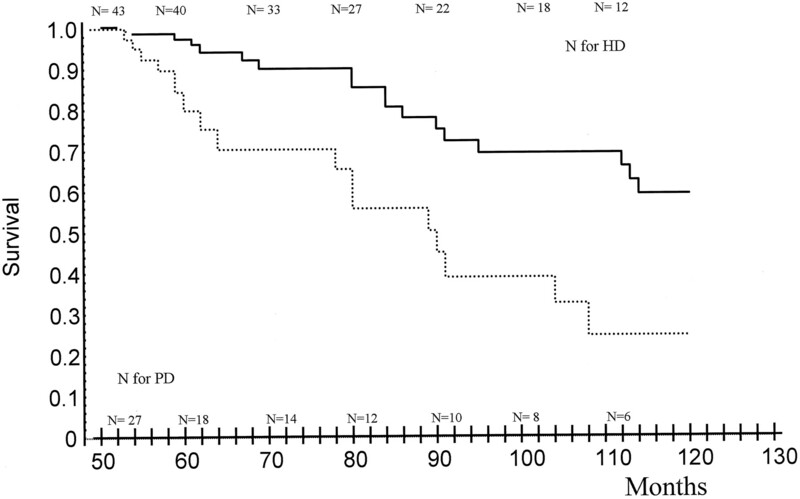 (9,10,12,20) also found no differences in patient survival between PD and HD. Recently, Fenton et al. (32), using Poisson analysis for intention-to-treat survival of the patients in the Canadian Registry, demonstrated that survival of PD patients was superior compared to that of HD patients in the first 2 yr after start of RRT. After 4 to 5 yr, survival of PD and HD patients became similar and after 5 yr, survival on HD was better than on PD. Earlier reports on patient outcome of PD and HD gave conflicting results, ranging from favorable for HD over no difference to favorable for PD (2,3,4,5,6,7,8,9,10,11,12,13,14,15,16,17,18,19,20,21,22,23,24,25,26,27,28,29,30,31,32). As pointed out by Port et al. (17), correct interpretation of these studies is difficult because they differ in many aspects, such as type of statistical analysis (with or without correction for comorbidity, and presence of different factors of comorbidity), use of single center versus multicenter data, inclusion of incident or prevalent patients, and considered survival time. Differences in methodologic approach explain why in the analysis of the U.S. Renal Data Study (USRDS) data Bloembergen et al. found a worse outcome for PD compared to HD patients (18), whereas in a reevaluation of the USRDS data by Vonesh and Moran outcomes were comparable for PD and HD patients (31). Bloemberger et al. included prevalent patients, i.e., patients who were already on RRT for varying lengths of time at the moment of the start of the analysis. In contrast, Vonesh and Moran made their analysis on the same database, using incident patients (patients starting new on RRT). Variations in outcomes may also be caused by center effects rather than by modality effects (30). A major component of these center effects may be attributable to differences in delivered dose of dialysis between the two modalities, as practices of measuring adequacy of HD and PD, and subsequent adaptation of dialysis dose, may vary widely from center to center. At present, no randomized controlled studies comparing PD versus HD have been conducted. Ethical and practical problems make it very unlikely that this type of study will be accomplished in the near future. However, there is enough evidence in the literature to claim that in centers experienced in both modalities, survival outcomes on PD and HD are at least comparable, and may even be better for PD in the first 2 to 3 yr after start of RRT (31,32). In our analysis, the outcomes of the patients who remain on their initial therapy for more than 48 mo and who were not transferred were worse for PD patients compared to HD patients (Figure 2). Also, in the study of Fenton et al. (32), outcome after 5 yr was worse in PD patients, and in the study of Bloembergen et al. (19), duration of dialysis was a more substantial risk factor for PD patients than for HD patients. These results could be explained by the deterioration of the quality of the peritoneal membrane and by the progressive loss of RRF. Both lead to a progressive decline in total adequacy and fluid balance problems, resulting in a decreased survival (34). In view of the correlation between adequacy and patient survival, timely transfer from PD to HD when adequacy targets cannot be obtained or when ultrafiltration failure occurs is more recommendable than the application of technically unrealistic or socially unacceptable PD prescriptions, or continuation of inadequate PD. Also, when there is doubt about patient compliance, transfer to HD should be considered. In contrast to a PD patient who is transferred to HD, the outcome of a patient transferred from HD to PD was not associated with improved survival (Figure 4). This observation can be explained by the importance of RRF. HD patients who are transferred to PD usually do not have any RRF left, and sufficient PD adequacy is therefore more difficult to obtain (35). Mortality in the first few years after start of RRT was in the Canadian Registry higher in HD than in PD patients (32). This difference disappeared after 4 to 5 yr. 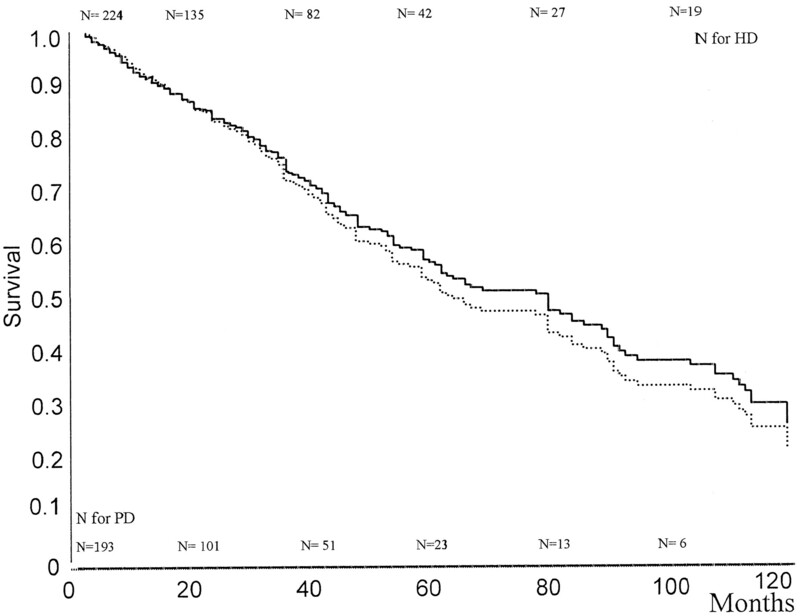 It is striking that this survival pattern coincides with the decline of RRF in PD patients (36,37). RRF has a substantial impact on total solute clearances, and thus on adequacy and on survival (38). Maintenance of RRF as long as possible should thus be of great concern to every nephrologist (39). It is well known that RRF is preserved longer in PD patients than in HD patients (36,37,40). In addition, the longer preservation of diuresis and RRF and the continuous nature of the PD treatment offer the patient a certain flexibility in his or her daily life (41). By starting ESRD patients on PD, the need for the creation of a vascular access can be delayed, which is of importance since in many patients it is cumbersome to obtain a permanently functioning vascular access (42,43,44). In most PD patients, the need for transfer can mostly be predicted and a timely creation of vascular access can be planned. The latter has been related to improved quality of arteriovenous fistulae (44). Starting patients with ESRD on PD in view of an integrative care approach can also be seen as part of a program to preserve arteriovenous access. It has already been demonstrated that long-term survival after transplantation is at least equal in PD and HD patients (45,46). Our group (47,48) and others (49,50,51) demonstrated that immediate graft function after kidney transplantation is better in PD compared with HD patients, and that the need for posttransplantation dialysis is lower. These two factors might influence long-term outcome of graft function (52,53). 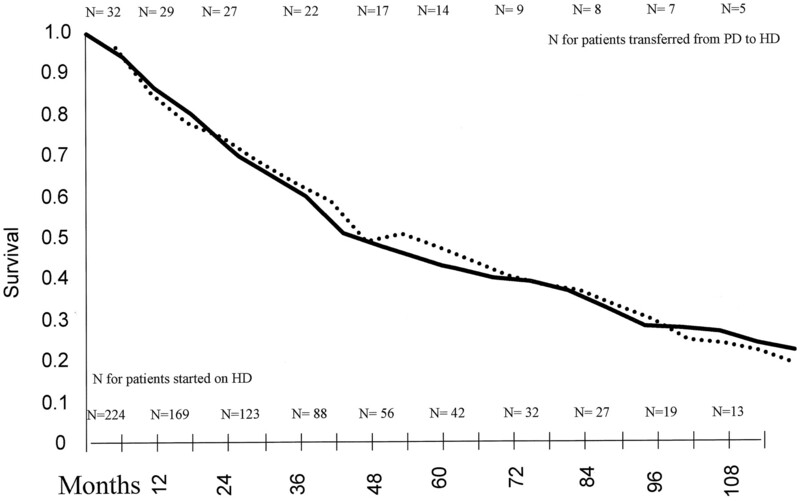 Finally PD patients have a reduced risk for infection with hepatitis (54). For all of these reasons, it might be beneficial to start RRT in ESRD patients with PD, and transfer them to HD when problems with PD occur. With such an integrative care approach, patients profit maximally from all of the available RRT modalities. The present analysis suggests that patients who were treated with this approach had a better outcome than the other patients (Figure 3). However, it may be argued that the integrative care patients had a survival bias since they had to survive at least some time in order to be able to be transferred. Therefore, a matched-pair analysis was performed. In this analysis, integrative care patients were matched with HD patients who were at least as long on HD as their matched integrative care patient was on PD. Even when survival was analyzed this way, a survival advantage was seen for the PD group between 2 and 5 yr after transfer (Figure 6). For patients on the waiting list for transplantation, this means that their probability to survive until a cadaveric donor kidney is available is increased. 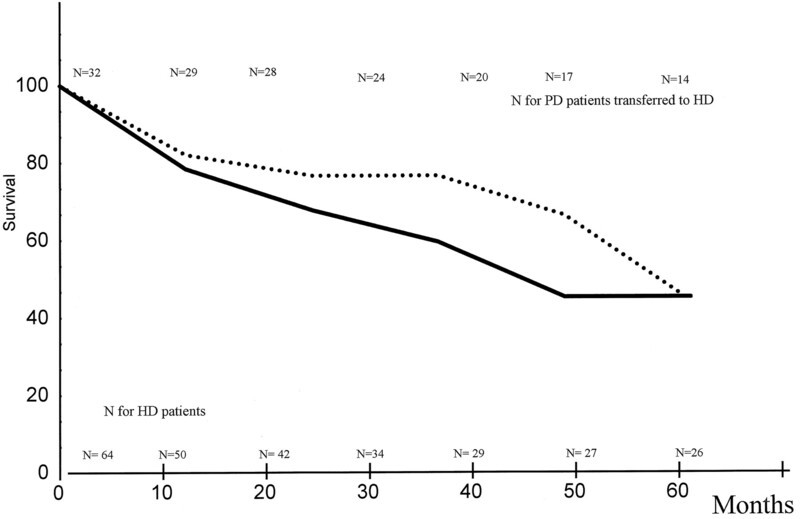 We also constructed a survival curve including all patients started on PD, and with separate hazard functions before and after transfer, whereby a fixed percentage of patients was transferred from PD to HD every 6 mo (Figure 5). This method was used previously by other authors to analyze survival after heart transplantation (33). In this way also the probability to survive until transfer is accounted for. This analysis showed that there was no difference in survival between patients started on HD and remaining on HD and integrative care patients. Because our study is retrospective, it is acceptable that this represents the worst possible outcome of integrative care, as in a prospective study on integrative care, all patients should be transferred when problems arise. In our study, probably some patients were still transferred too late, which might have influenced the survival curve negatively. We recognize that this single-center study is retrospective and extends over a long period of time (from 1979 to 1996), and it may be argued that over these years many changes in the practice of both HD and PD have occurred. In view of these drawbacks, the generalizability of the concept of integrative care needs further confirmation by analysis of a larger data-base. In conclusion, our data suggest that an integrative care approach does not jeopardize patient outcome, at least if a timely transfer to HD is performed when problems arise. Because this approach can improve the problem of RRT availability induced by the continuously growing ESRD population and by budgetary restrictions, we believe that this concept can be of value for the whole nephrology community, and that further investigation in a large-scale study is warranted. The authors thank the nursing team of the Renal Division of the University Hospital Gent. The technical assistance of P. Vogeleere is gratefully appreciated. Port F, Wolfe R, Bloembergen W, Held P, Young E: The study of outcomes for CAPD versus hemodialysis patients. Perit Dial Int 16: 628-633,1996 .